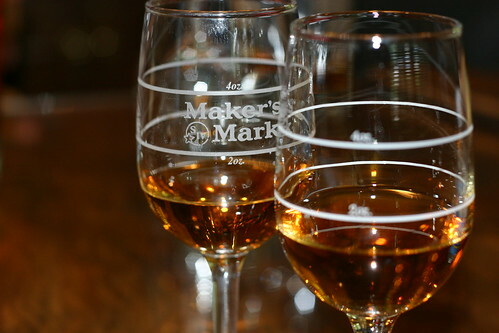 On July 1st Maker’s Mark will release Maker’s 46 their first new bourbon since the distillery began production in 1953. Now, on the surface this doesn’t seem all that interesting. There are lots of bourbons on the market comprising different mash bills, distillation techniques, barrel constructions and ages. 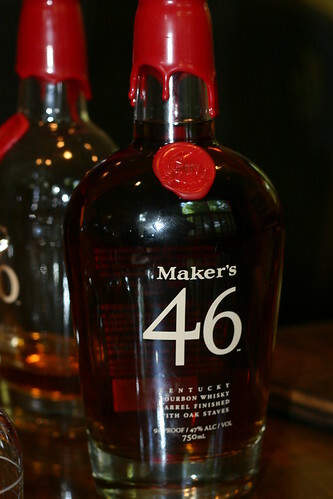 Maker’s 46 doesn’t follow any of those of traditional paths to obtain it’s flavor profile. Maker’s Mark’s master distillers Bill Samuels Jr and Kevin Smith have come up with a new technique which is not only something I’d never heard of, it also produces a bourbon with a uniquely fantastic character. Last weekend Maker’s Mark offered to bring me down to the distillery in Loretto, Kentucky to experience Maker’s 46 first-hand. Clearly this was an opportunity I couldn’t pass up. I mean, when you hear the word Kentucky what’s the first thing you think of, rolling hills, blue grass, horse racing? Me, I think of bourbon. It’s the one spirit I feel is truly American and Kentucky is it’s home. So, naturally, it was a tremendous honor for me to be invited to visit Maker’s Mark in person, tour the distillery and sample their new bourbon. That said, in the spirit of full disclosure, Maker’s Mark did pay for my entire trip. However, they’ve neither paid me to give this review nor told me what to write. The excitement for Maker’s 46 you’ll read here is all mine. As Kevin Smith poured me two glasses of bourbon (one of Maker’s Mark and one of Maker’s 46) he explained to me that he prefers to offer his guests the “brownie” first, then while they’re savoring the flavor tell them the secrets to why it’s so delicious. But, to really understand and appreciate Maker’s 46 you first have to understand and appreciate Maker’s Mark bourbon. And that’s where my education begins. As you bring a glass of Maker’s Mark to your nose for that first gentle sniff you notice the mellow brown color associated with a fully matured whiskey. In the aroma scents of caramel, toffee and vanilla are the stars. For me, the aroma of Maker’s Mark brings up images of sweet desserts, creme brulee, homemade caramels, fresh vanilla pudding and the like. Suffice it to say, some seriously pleasant mental images. Now you get to take that first sip and you find that the flavor matches the aroma to a tee. All those dessert like aromas and mirrored in the flavor. And, to top it all off, Maker’s Mark is tremendously smooth. Now that I’ve sampled Maker’s Mark and I have a fresh mental image of its aroma and flavor I pick up my glass of Maker’s 46 that I’ve been hungrily eying since it was poured for me. The first thing I notice about Maker’s 46 is the color is a touch deeper than that of Maker’s Mark. The aroma of Maker’s 46 holds the same elements that I love so much about Maker’s Mark, but it elevates them to a new level of intensity, but there’s more there too. I’m now picking up a spice quality that I didn’t get in Maker’s Mark. Now I get to taste. Like the aroma, the elements of vanilla, toffee and caramel are there, but punched up to new levels and with them come new spice flavors. I’m now getting hints of Christmas spices (nutmeg, cinnamon, allspice, etc) that weren’t there before. As I swallow I notice the aftertaste is still very pleasant and lingers for a wonderfully long time. As I’m enjoying that lingering aftertaste I’m reminded of the flavor that you get from a cinnamon candy. I’m sure you know the flavor I’m talking about. It’s the cinnamon spiciness that lingers in your mouth and seems to provide a warmth all it’s own. At this point I’m truly stunned by the complexity of flavor Maker’s 46 brings. It’s something I’ve never experienced in another bourbon. And, as I continue to enjoy this fine spirit, my excitement is renewed with each subsequent sip. Maker’s 46 is a bourbon that makes me want to sit down, sip and watch the world go by. This likely doesn’t sound all that amazing, but understand that the number of times I’ve sat down for a glass of straight bourbon I can count on one hand. Now that I’ve gotten to sample the metaphorical “brownie” Kevin begins to explain why the flavor is what it is. After making their iconic bourbon for over 50 years Bill Samuels Jr and Kevin Smith were hearing some interesting things from die hard Maker’s Mark drinkers. Namely Bill and Kevin were told that, while they love Maker’s Mark, every now and then they like to pour a glass of something bolder and spicier. But, after they’d indulged that desire they always came back to Maker’s Mark. So the idea started to coalesce that maybe Maker’s Mark could produce another bourbon that would give those die hard drinkers the spicy character they crave every now and then. The immediate question was how could Maker’s Mark create that flavor profile? As though that task wasn’t hard enough to begin with, Bill threw a couple more wrenches into the cogs. He insisted that however they got that sought-after spiciness it couldn’t be done with rye and it couldn’t be done with lengthy aging. Now Kevin had a real challenge on his hands. You see, rye inherently provides a spicy quality and lengthy aging will produce a similar flavor as the bourbon continues to interact with wood in the barrel. So Kevin began experimenting. With the help of Brad Boswell, the owner and “wood chef” of Independent Stave, Maker’s Mark’s cooperage they tried new barrel designs incorporating new mixes of wood types and char levels. Kevin tried new ratios of grains for the mash bills and changed up the fermentation process. However, nothing seemed to result in the flavor profile they were after. Then, one day while Bill and Kevin were discussing the failed attempts they came to a realization, they didn’t have a clear vision of what the finished product would taste like. So they started brainstorming. The conclusion they came to is that they wanted to preserve the qualities of Maker’s Mark that made it so delicious (vanilla, toffee, caramel, smoothness) but add a layer of spiciness that isn’t usually present. At that point it became clear to them that the new bourbon should be based on fully mature Maker’s Mark rather than a completely new mash bill. Now that the goal was clear and Maker’s Mark had been chosen as the base the only question that remained is how to achieve the goal. Finishing the mature bourbon turned out to be the answer. Understand that finishing whiskey is not a new development. You’ll find a number of scotches that have been finished and there are even a few bourbons that are finished. However, the process that Maker’s Mark uses is a first in the business. First, Kevin tried taking the mature Maker’s Mark and moving it to a new charred oak barrel for a second aging. The result was not what they were looking for. Next, he turned back to their wood chef, Brad, for some ideas. The solution they decided on was to add seared wood to the matured bourbon. While this answered the question it brought up more questions. What type of wood? How much searing? How long to age the bourbon? How much wood to add to each barrel? After a sizable number of small scale tests using wood chips the answers came clear. 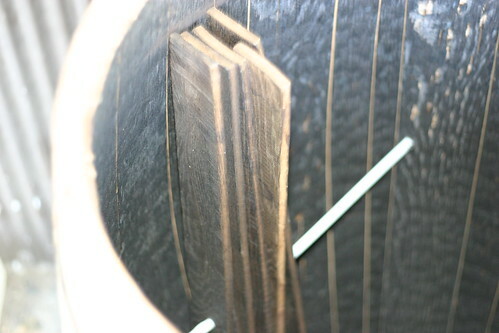 The seared planks that were decided on, which Brad has labeled profile 46, are ~1/4″ x 2″ x 30″ French oak that has been seasoned (air dried) for 18 months and seared very quickly at a very high temperature. The result of the searing process is a wood plank that has been toasted to just under the point of ignition. So, now that the wood plank profile had been found, they figured out an ingenious method of suspending the planks inside the barrels to allow the whisky maximum contact with the planks while it ages. So, the decided upon process is this. Empty the fully matured Maker’s Mark and pop the heads off the barrels. Attach 10, yes exactly 10, seared oak planks to the inside of the barrel. Now you put the head back on the barrel, put the ring back on that you had to take off and refill the barrel. The mixture is then allowed to age for a further 3 months. 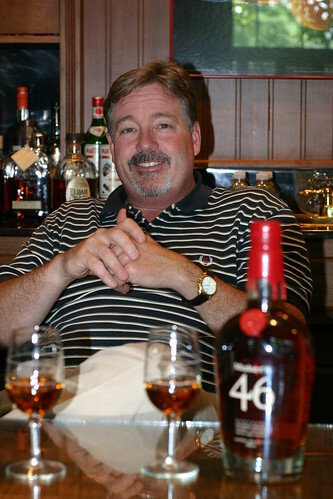 The resulting elixir is Maker’s 46, named for the profile 46 planks used for the flavoring. Maker’s 46 is then taken down to 94 proof, slightly higher than Maker’s Mark’s 90 proof, and bottled with the signature red wax. So, now you know the process and the history behind the creation of this new bourbon expression. I know I’ve gushed and rambled for quite some time now and if you’ve come this far I have one last message to share with you. Maker’s 46 is truly a fantastic bourbon and very much worth picking up a bottle. It’s great to simply sip neat or on the rocks and I’m very excited about the cocktail possibilities. Look for it in stores starting July 1st with a price point of about $32.